Wanted to make a thread where users can post the hours they have on there plasma so we can get an idea of what time we have left with these great displays. 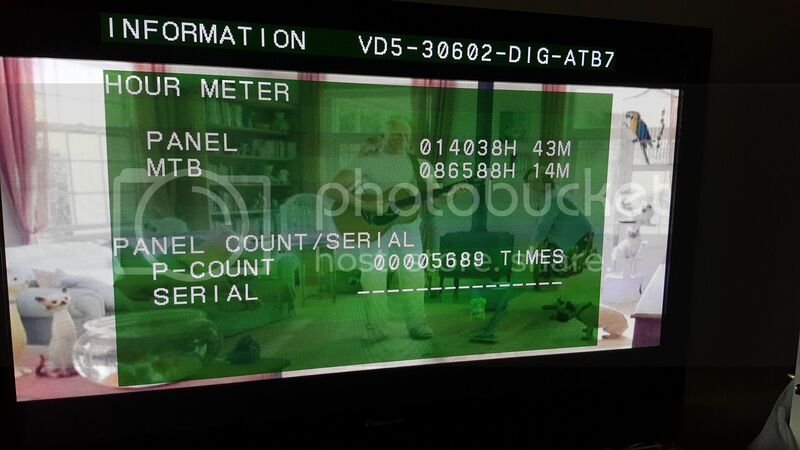 Post the model number and if tv has ever been repaired to keep it going. Use this article to check the hours. If your model is not covered in this article google is your friend. 6. Panasonic TC-P50GT30 14600 hrs. SC board repaired at 14600 hrs. Last edited by Test Ickles; 09-20-2017 at 08:46 AM. 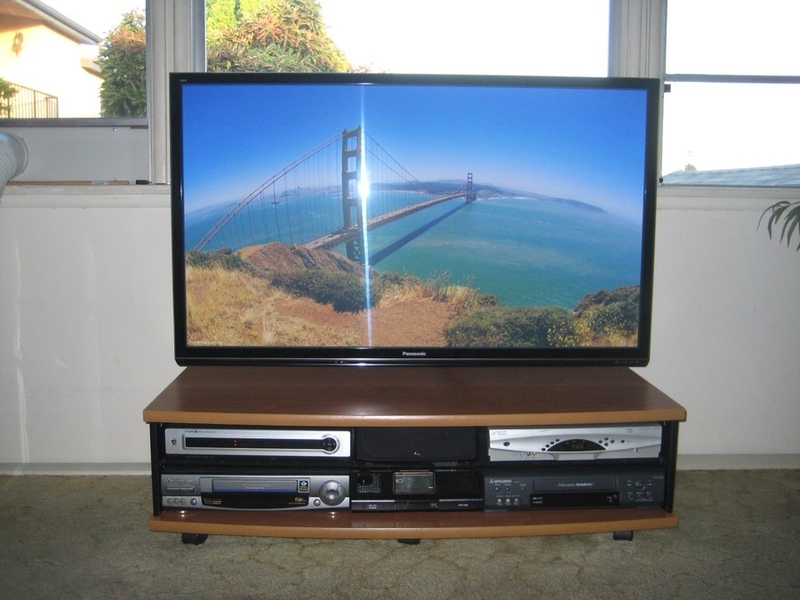 The TV works great, but once it's been on for a couple of hours, I can hear a very light constant clicking (fast clicking) sound coming from the left of the TV. Maybe it's on its last legs. Oh well, it lasted for 5+ years. Samsung 51" F8500 with 8000 hrs....just replaced the Power Supply board. Epson 8350 / Panasonic AX-200u / Optoma Graywolf 92" / Draper Luma 92"
Interesting. GT30's are famous for bad SC board. Doesn't sound like that issue. Great thing about these TVs is they are pretty easy to fix if you like DIY. I have no data to back it up but it seems like Samsung has more failures than Panasonic. Looking through Bad Caps forum it seems there are more Samsung's. Panasonic has a lot though too. Id say that Samsung has a higher failure rate with it's plasmas, as a general truism. Pioneer Kuro 5080HD (Purchased Dec 2007) - 29,659 hours - No repairs - Used daily primarily for gaming, Still working great and zero burn-in. RandyWalters, Edllguy, PioManiac and 4 others like this. 2007 Panasonic's seem to be pretty reliable. Built like a tank. I've got one on my list still going strong. Now that's a tank! Most hrs I've ever seen. Curious if anybody has that beat! Edllguy and 8mile13 like this. What is this "count" number referencing? PS- Im looking to pick up a Pioneer 5020fd or 111fd or 101fd. It's the number of times the TV has been powered on. Both displays are still used almost daily. I've never had any repairs on any of my gear. Last edited by PioManiac; 10-23-2016 at 08:10 PM. Very cool thread! 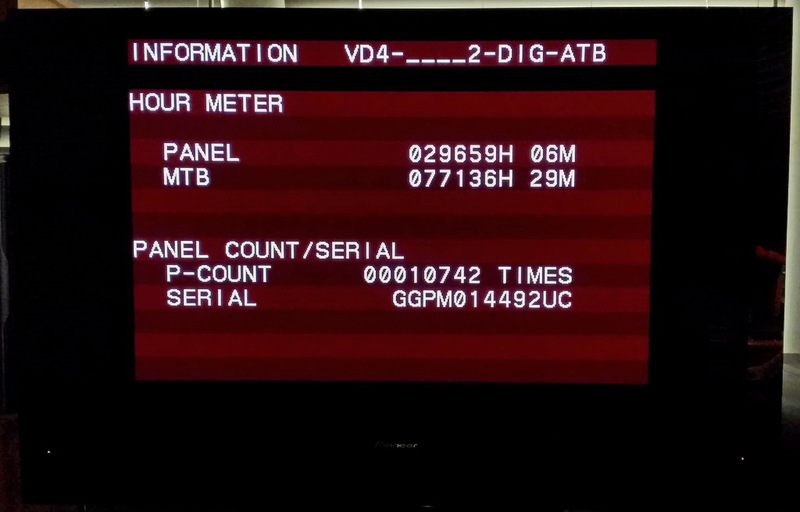 How do I see this on my Samsung F8500? To the world, you are just a person. To a rescue dog, you are the world! I own an LG 60" plasma and would like to join this conversation…but I have never kept any kind of record on how many hours are on the set. I do know it spent a whole year on almost all of the time, but again the hours were never clocked. I have heard that plasma TV's were headed "fast & furious" toward extinction…I love the color saturation on my plasma, but to my untrained eye the 47" LED TV in my bedroom looks equally bright and sharp. 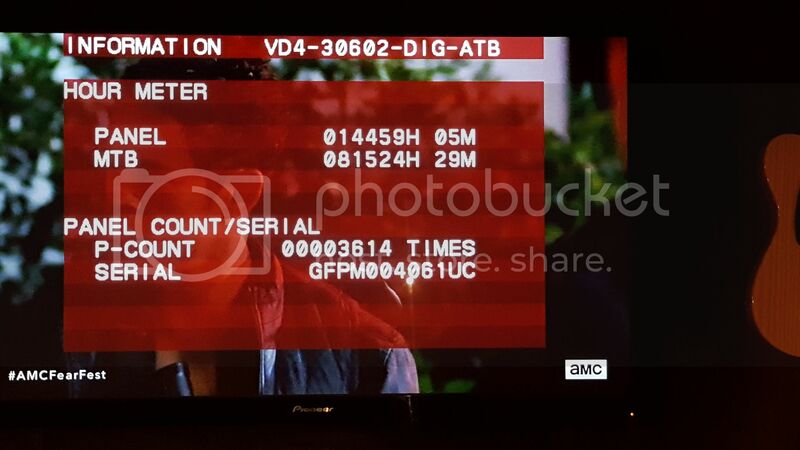 Many of you seem to know down to the 1/10th of an hour how many your set has clocked…is there some sort of "time keeper" function on the TV that will help identify the hours used (and, conversely, perhaps the hours "left")? Retired twice, back at work again...but still attempting to age disgracefully! With your Samsung remote and the screen off, hit 1-8-2-mute-power and the technician's screen will come up. Scroll down to Service, enter, and the panel hours will display. Samsung PD64C7000 6290 hours replaced screen within 3 months with big vertical bands. Samsung PN50C8000 905 hours vertical green line just started this weekend. Long out of warranty. Waiting for service appointment. Panasonic 50S64. 9875 hours. Flawless. Looks better than ever. Last edited by azyme; 10-24-2016 at 11:15 PM. I dont think the Kuro models came out until 2007. My 2006 Pio was a non Kuro 5070. My 2008 Pio was a 5080 Kuro. Here is a thread ''how to check the hours used on your Plasma''. Last time I checked our old Samsung HP-s5053 (circa 2006) had almost 59000 hours on it, that was about a year ago. I don't check it much because going into the service menu resets all the picture settings back to default. It got relegated to the bedroom sometime back and gets used mainly for gaming these days. Repaired once at @ 1year due to the sparkling issue those sets had. New panel and various boards. Last edited by andy A; 10-24-2016 at 06:22 PM. Panasonic TC-P50V10 19650 hrs 8082 count. Never been serviced and the only issue is an occasional buzzing sound during bright images. The words above are based on loose facts mixed with my opinion, the latter of which is subject to change. Wow! You've got to post a screen shot of that one. May be an all time record. BruZZi and EscapeVelocity like this. 64" Samsung F8500 has 5552 hours and no issues after 25 months despite dire warnings from 'concerned' forum members of units purchased from non-authorized dealers. Tonight's panel temp reading after 3 hours is 36C. Before mounting it on wall added 2 low profile fans which I'm convinced improves longevity. 2008 Panasonic TH-C50FD18 from Costco.